This past weekend, I discovered that the Graphicly Facebook app is smoothly integrating with Facebook pages. This is the biggest comics news for me personally because I’ve been holding my breath waiting for the moment that I could start using the feature. To give a basic overview, Graphicly is the more social-network-sensitive digital comics service out of the Big Three: ComiXology, iVerse Media and Graphicly. Being a heavy user of social media and a bit of a comics reader, this is a fascinating development for me. I have started a Facebook page which I believe can function a bit like a book club. I’ll be able to embed specific comic files from Graphicly (similar to YouTube) and people who visit my Facebook page will be able to actually read the file right there. For the purposes of discussion, I’m searching out comics that are free or which have lengthy previews so that we can try to get a little bit of chatter going. Facebook.com/LetsGoAyo –come and hang out! I attended but did not exhibit. I spent time with some established friends, made some new friends and got super-mad about comics. Which sounds like a regular day, except adding a crowd of maybe one hundred-thousand people. I found myself in a very unusual position this year because things that I like a lot such as Adventure Time and HomeStuck are actually popular. I’m used to being an extreme outsider at these sorts of things. I was pretty happy with the comic book publisher booths for Archaia, Top Shelf, First Second and Oni Press amongst others. Marvel Comics‘ booth reigned supreme this year with a towering monument to The Avengers complete with actors as S.H.I.E.L.D. 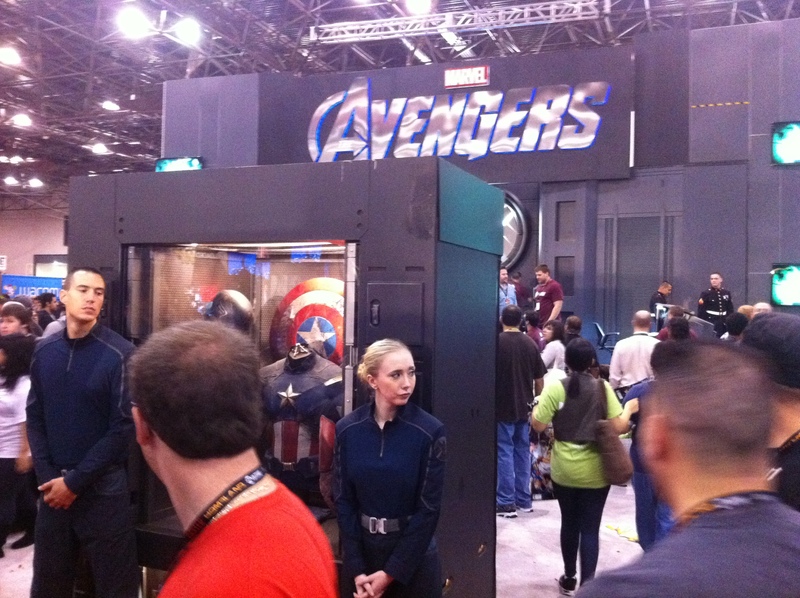 agents guarding Captain America’s uniform and shield. One thing that I want to impress upon people when I describe these cons is that Marvel Comics and chief competator DC Comics don’t sell comic books at these festivals. They don’t sell anything, actually. 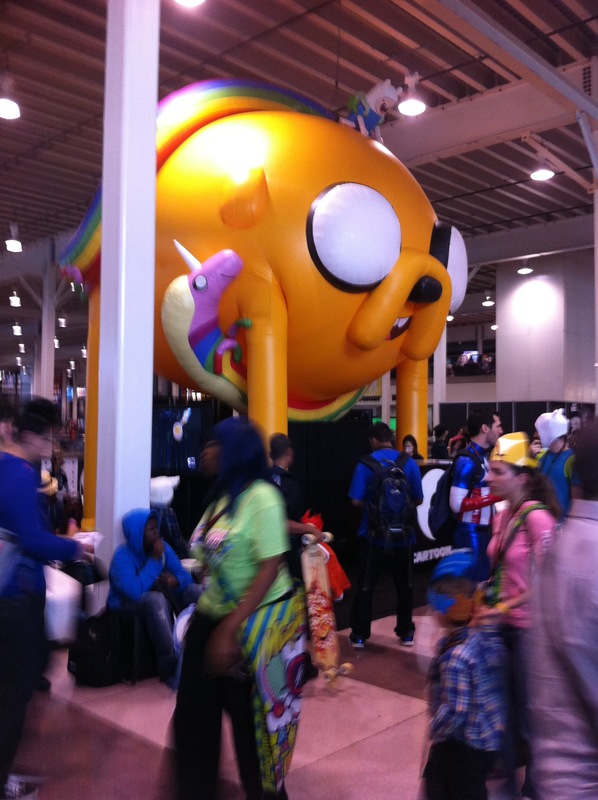 They use these comic cons as an opportunity to promote their respective brands, to encourage immersive fan interactions, to promote upcoming events, and to generally further a culture around their products. Of course, this is impossible for the other publishers to mimic because those publishers are dealing with properties that are owned by various creators. In DC and Marvel’s case, all of the properties are owned outright by the publisher and thus it is always a gain when they choose to take a path such as 2011 Marvel’s decision of promoting one product line (The Avengers). A publisher like Top Shelf cannot reasonably do that because all of their products are the work of individual authors who each need to have their fair chance to promote a particular project. Marvel therefore has two advantages: the obvious advantage of a greater amount of money in general, and the subtler advantage of being free to put the full weight of its marketing behind a single concept, and allowing that year’s secondary lines to merely enjoy any runoff. The artists’ alley had tables from the best-known mainstream superhero artists to small-name creators looking to make a name for themselves. Always remember: if you care about comics as an artform, you will spend a good amount of your time in the artists’ alley at these types of shows. On the other hand, I found myself spending an unprecedented amount of time becoming acquainted with the world of vinyl toys and illustrators’ poster-prints. There’s so much at these comic-con shows that each year you go back presents a new opportunity to dive into something that is brand new to you. Dark Horse Comics‘ area had a combination of experiences. On the soft carpeting of their exhibition space there was a small stage for Dark Horse authors to talk to fans and hold signing events, but on the side of that was a standing display area showing off two iPads with Dark Horse’s digital comics app installed and ready for passers by to browse. This is the most obvious and simple thing that comic publishers need to do at these festivals. 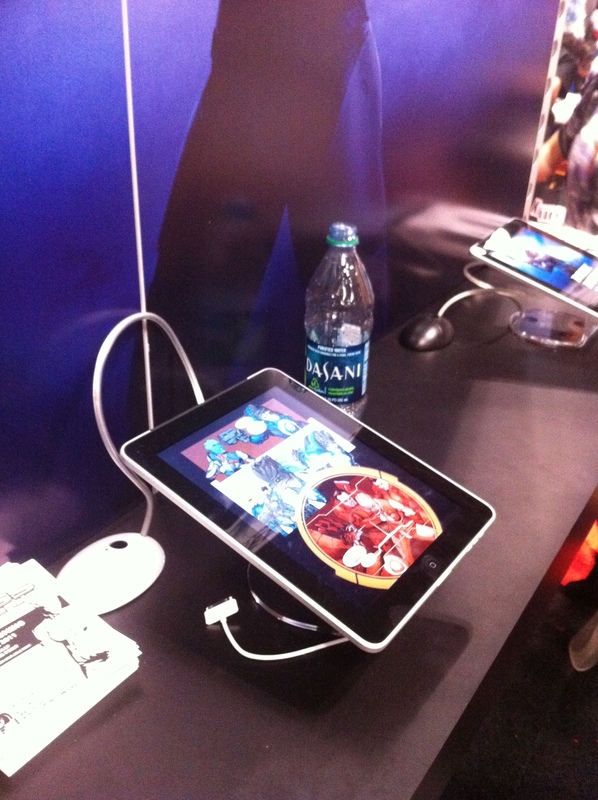 Comic books look spectacular on the iPad; and having two digital readers on display allows show goers who are soaking in the spectacle of the festival in general to get a quick blast of the product itself, in all its glowing, brightly-colored glory. 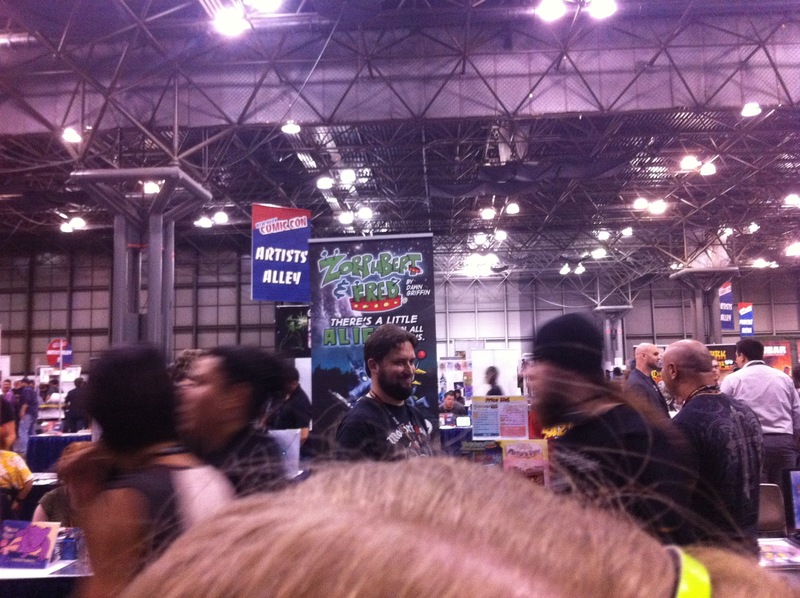 Only true regret of this year’s NYCC is that I found that the panels were far more crowded than they had been in years previous. I usually prefer to spend a day of this festival just sitting in panel discussions, but this year, I didn’t get a chance to even attend one!